Leslie H. Tayne, a renowned lawyer with a practice concentrating in debt resolution, received the dignified honor of being recognized as Touro College Jacob D. Fuchsberg Law Center’s Alumni of the Month for March, 2012. Touro’s prestigious award recognizes Ms. Tayne’s influence as a leader in her legal field as well as her many contributions made to the community through public service. Previous recipients of the award include New York State Senator John J. Flanagan, Honorable Jeffrey Arlen Spinner, Senator Kenneth P. LaValle as well as many other distinguished alumni. 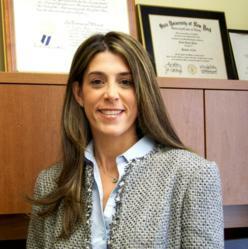 Tayne graduated in 1996 from Touro Law School and participated as a member of the distinguished Moot Court. In 2001 Tayne founded The Law Offices of Leslie H. Tayne P.C., in Melville, N.Y., and has since extended her services to additional offices in Westchester County, N.Y., located in White Plains and Mount Kisco. The firm concentrates in the unique practice area of consumer debt resolution and bankruptcy avoidance for consumers, small business owners, and professionals seeking help with their current finances. Her mission is to reshape consumer debt resolution alternatives by presenting clients a supportive and reliable environment built on experience, trust, and results that will not only relieve clients of the stress from debts, but also the burden of the never-ending debt cycle. Tayne’s commitment to the public service sector is admirable. As the Vice President of the Work and Family Committee for Long Island Women’s Agenda, Tayne raises awareness of the issues affecting working women faced with the difficulty of caring for children and those caring for aging parents in the sandwich generation. Ms. Tayne also volunteers a substantial amount of time as a puppy raiser for the Guide Dog Foundation of Smithtown, caring for and training a puppy that will one day be a service dog to someone in need. Additionally, she is an active supporter of and volunteers her time at the Family Services League in Huntington in the debt counseling division. She lives in Melville with her three young children. Recently Tayne was honored with the Leadership in Law Award in the Sole Practitioner category. The award, given by the Long Island Business News, was created to recognize those individuals that dedicate themselves to excellence and leadership in both the legal profession as well as their communities. Based in Melville, N.Y., the Law Offices of Leslie H. Tayne is the only New York State practice whose sole concentration is consumer debt resolution and bankruptcy avoidance. Founded in 2001, the company has expanded into Westchester County with offices in White Plains and Mount Kisco, N.Y. On average, the firm is able to settle debts for 30 to 42 percent of what is owed, and can handle any amount of debt over $5,000. Tayne, who previously served as the chief in-house counsel of a national financial company, where she oversaw the resolution of hundreds of thousands of dollars in unsecured debts, attended Touro Law School, where she was a member of the Moot Court Board. A mother of three, Tayne is also associated with the Westchester County Bar Association, the Suffolk County Women’s Bar Association, Nassau County Bar Association and the Melville Chamber of Commerce, among many other groups. Visit The Law Offices of Leslie H. Tayne online at http://www.attorney-newyork.com or call Toll-free at 866-890-7337.